IMPORTANT - Restrictions on use No dogs. No competitions. No Club meets. No training without permission. No large numbers, a maximum of 5 gliders in the air at any one time. Do not fly to Winder as the farmer is very hostile. Nesting skylarks in the spring and early summer. Easily visible from the M6 south of Tebay, this is a brilliant site, big and generally smooth. Often flown in conjunction with Fell Head, which is a good thermal source. Can be extensively flown to the north and the south in the right conditions. If breezy in the car park, don't bother. The hill has a pronounced wind gradient. The postcode centre is at Mire Head. This is about 500m SSW of the parking area. Best approached from the A685 between Tebay and Kendal. From the north, leave the M6 at J38 and take the right turn at the roundabout from Tebay. Approx. 4km south of Tebay the road goes over the motorway and the road swings downhill on a left hand bend. Turn left passing under the railway and motorway heading for Carlingill. Don't be tempted to follow the road into the farmyard, you need to turn left immediately before the farm buildings. Follow the narrow tarred road approx. 3km. - after 500m you cross the Lune river and then steadily up the hill for 1500m past a farm on the left. The road turns sharply to the left and then over a cattle grid. Sharply right over Carling Gill bridge and then across the open fell road. 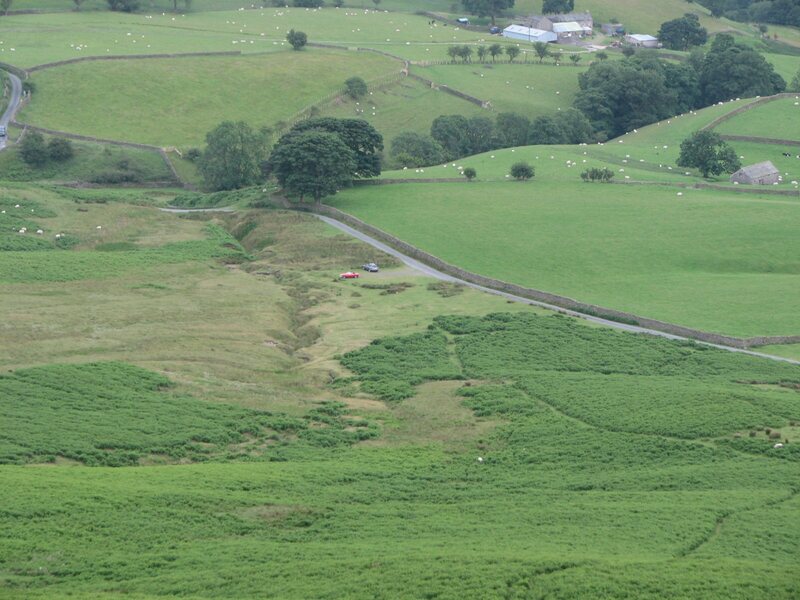 When you see a wall on the right look out for and park on the left at the grassy pull in area at the foot of Linghaw Fell. In 2013 there is currently a large tree root which someone has plonked in the parking area. Some holes have been drilled in it and it makes a good windsock base. From the south you can leave the motorway at J37 and follow the minor road immediately to the east of the motorway that goes north. Follow this road alongside the motorway and railway until it descends steeply before a disused railway viaduct. Turn right and immediately left under the railway viaduct (while admiring the workmanship!). Be aware that the bridge over the Lune the east of Beck Foot is narrow - a Land Rover will fit. Go up the hill and turn left at the crossroads. The parking place is on the right shortly after the cattle grid. From the grassy parking area make for the fell top using the obvious path through the bracken that runs up the left side of the hill. The farmer at Whins Farm has common grazing rights on the fell and is happy for us to fly as long as we do nothing to upset him; have a chat if you meet him. In 2009, he's been turning up on his quad bike with eggs to sell. He's very friendly and the eggs are free range! Please avoid large numbers. If not flying, ball up your canopy and be unobtrusive. Flying mid week needs to be treated with caution as fast jets often use the immediate area. Always NOTAM mid week. 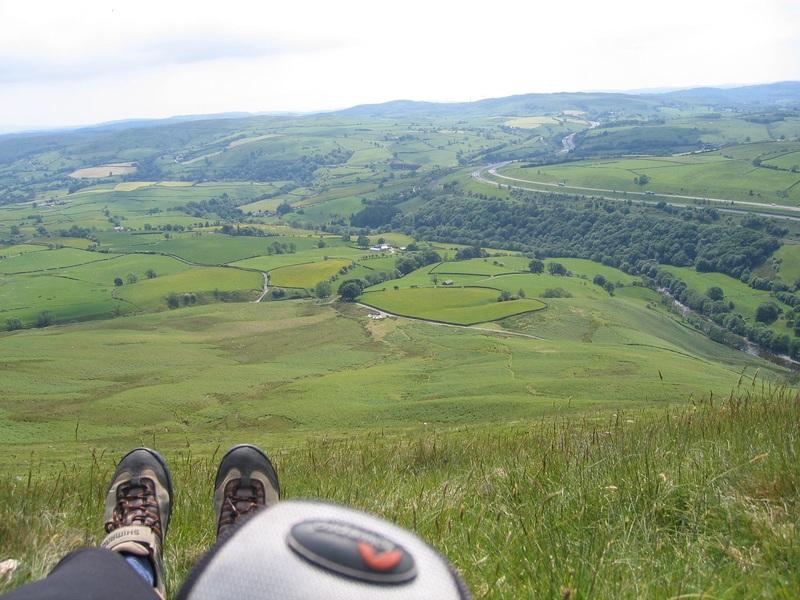 Do not get low in the gulleys and keep well forward; if windy, getting blown over the back is not an option. Can be very thermic generally and bouncy in the landing area and rough if the wind goes off to the south. 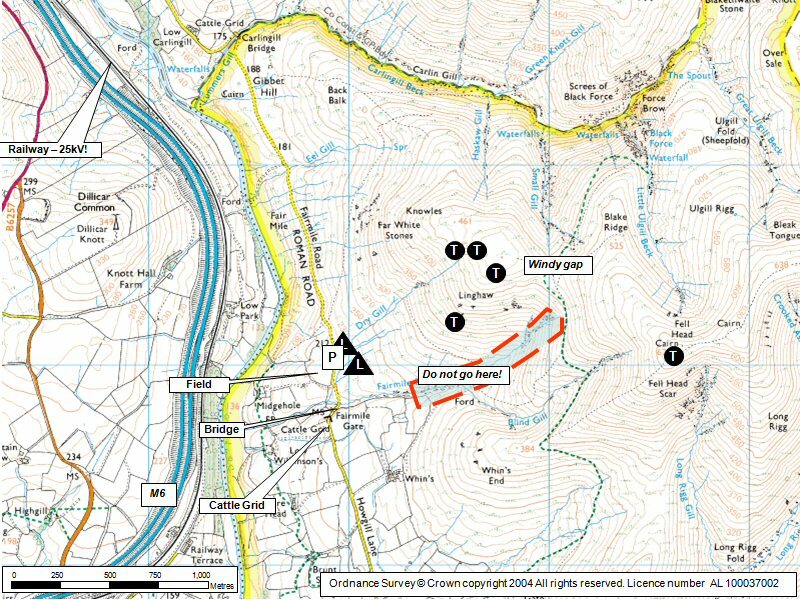 Nearest public phone is at Chapel Beck 3 km down the road towards Sedbergh. Depending on the breeze anywhere on the fell but best at the top left or right as you look at the hill from the car park. Can be entertaining! There is a stream gully and a large tree stump as well as the parked cars to avoid. It can be quite deceptive as the slope is just about your glide angle. Aim to land short if it is thermic. A great site one of the best in the guide. Copes well with a range of wind directions and the advantage of Fell Head for extending the take off options. Really nice soaring and lots of XC potential it often works well out from the ridge and you can spend hours thermal soaring out in the valley while others are scraping around on the ridge. Micro triangles and out and returns are all within the scope of less experienced pilots. Be cautious if heading south to the Calf as bottom landing out is not a plan. Best to stay well out front and use the valley thermals to go to Winder and back. Don't land or take off on Winder. The site offers great opportunity for long XC flights. The record now stands at 72.3km for a flight to Northallerton. However, the XC opportunity must be taken early in the day as the site is frequently subject to the sea breeze. Don't go directly over the back on the first big thermal as its very common to then experience deep sink and then be forced to land out in the Howgills. Some of the valleys are quite steep and narrow. Recommended tactics are to take a big thermal to a minimum of 3000 ft and set a course for Mallerstang. If you start to experience the sink hole effect then start to fly to the north. 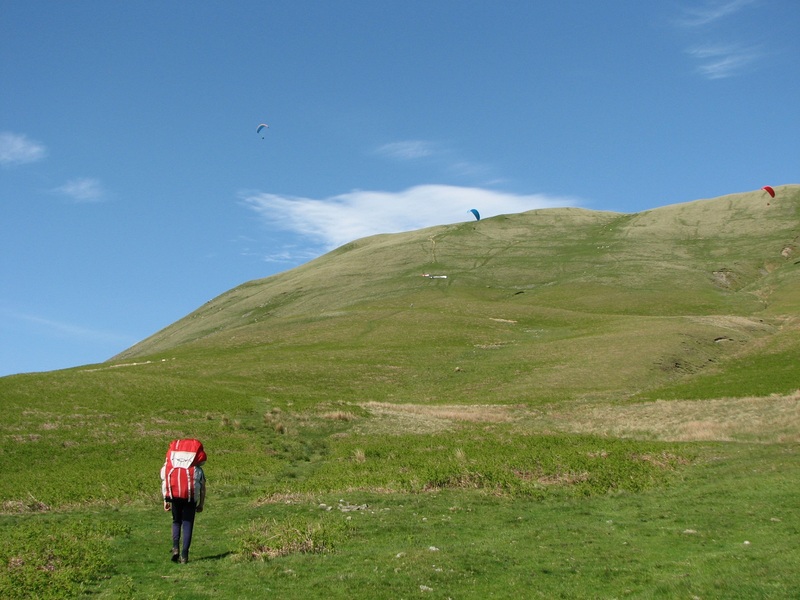 Most of the time you will probably find some lift; the other times, at least you are closer to the Tebay to Kirkby Stephen road so that you reduce the distance you have to walk. Looking down from the take off level. This picture was taken a little to the south of the main take off area - you would expect to have the track on your left if you were sitting at take off. From this angle, the landing area looks quite small - it is! The wall on the other side of the road is strangely attractive to paragliders. If you get into any doubt on your final approach to landing just move off left to the other side of the beck. It's a big area but is a bit more damp. On a standard Whitestones day, it can be difficult to get down; the best method is to get right over the river where descending air is normally found. Don't land on the railway! It's electrified at 25,000 volts. Looking down on the landing area/parking from the fell. The main landing area is the green area to the right of the cars, note the wall on the overshoot. The second landing area is to the left of the stream, it can be damp. Notes : The second pub on the left as you come in from the south. (We believe that the first pub has now shut) The Steak and Ale pie and the Lamb Henry have been approved by the CSC tasting committee! Black Sheep Bitter from Masham on tap.